This week I was very excited to hit the 10,000 follower mark on my Facebook page and to celebrate, I wanted to make gluten free doughnuts! 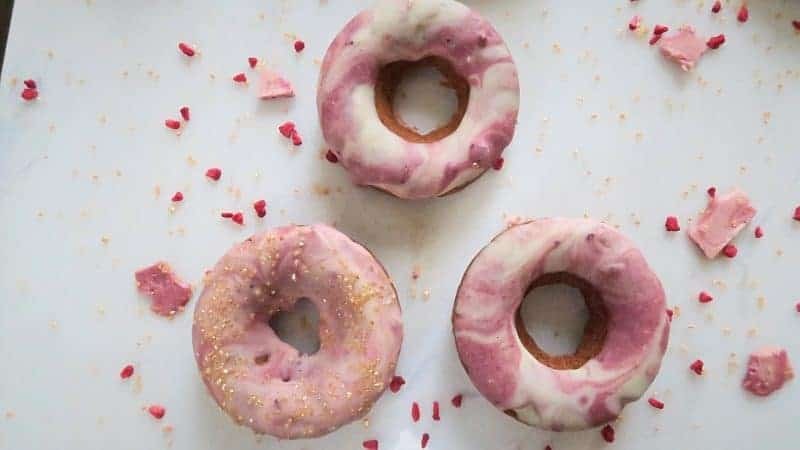 I’ve made several varieties of baked, gluten free vegan doughnuts before, but I’d been dying to make gluten free red velvet doughnuts for ages. So this magical milestone seemed like the perfect excuse! While I only avoid gluten in my diet due to my coeliac disease, I know a lot of my followers and blogger friends also cannot have egg and/or dairy. I wanted to make these red velvet doughnuts as inclusive as possible, so they are gluten, egg and dairy free, and therefore vegan too. My favourite thing about these gluten free red velvet doughnuts though? The red colouring is completely natural! I used my new favourite toy in the kitchen to colour them – powdered beetroot! I picked some up from a spice stall at one of the Barnstaple Real Food Markets and have loved playing around with it. 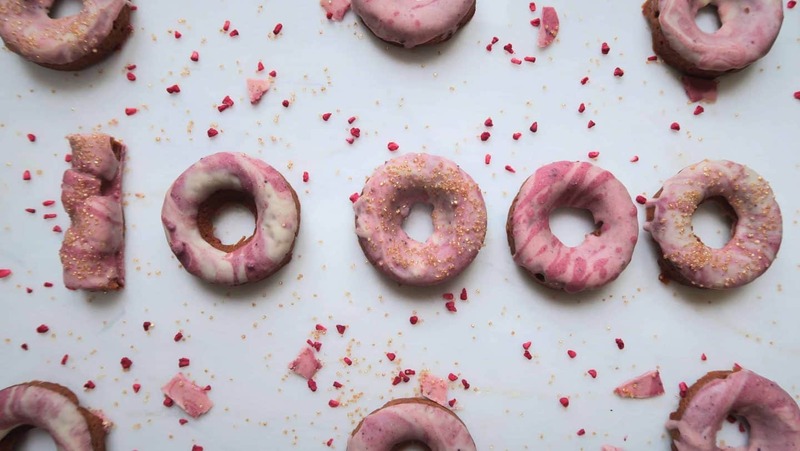 It gives food this beautiful, rich pink colour – these doughnuts just look so pretty. 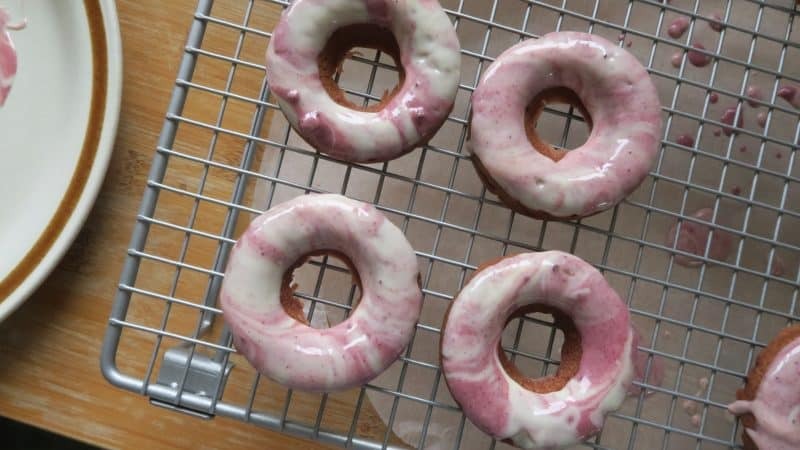 I used Sainsbury’s Deliciously Free From white chocolate to create the glaze – this way the glaze is dairy free, as well as the doughnuts themselves. You could easily use normal white chocolate if you don’t have to avoid dairy though. A little coconut oil gives them this gorgeous shine – I had great fun playing around to get the marble effect, before dowsing some of them in gold glittery sprinkles! I’ve made this video to show simply how to make these gluten free and vegan red velvet doughnuts, or scroll down for the full recipe! Making the marble effect is so simple. To do this, I split the bar of white chocolate and melted it in two separate bowls with the coconut oil. I poured one onto a plate, then to the other I added some beetroot powder. I ‘blobbed’ some of this pink chocolate onto the white stuff, swirled it round a little with a knife, then dipped the doughnuts, et voila, a marble effect! 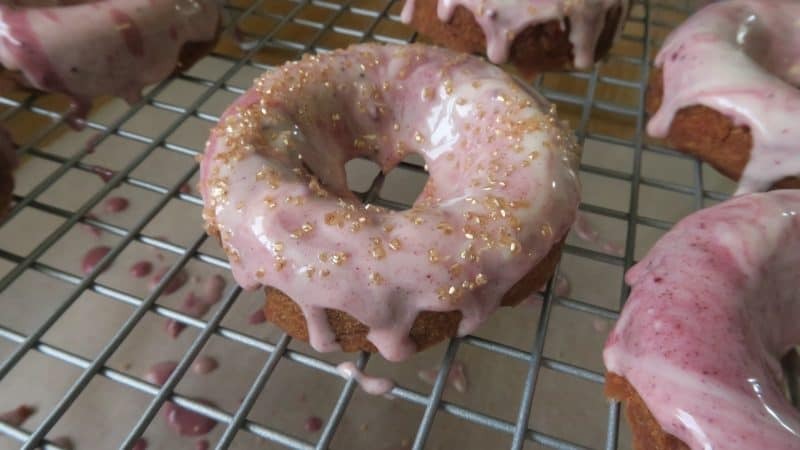 I have my lovely friend Lauren to thank for teaching me this – check out her out-of-this-world galaxy doughnuts here. These doughnuts are so easy to make and I really hope you like them! Make sure you post a picture on my Facebook page if you make them, or tag me on Instagram or Twitter. I love seeing your creations and twists on my recipes so please keep sharing them! Beautiful red velvet doughnuts which are gluten free and vegan, with a marble, dairy free, white chocolate glaze. Preheat the oven to 180’C / Gas 4 /350’F. Place the chia seeds in a mug and cover with the water. Stir well and set aside for 15-20 minutes – this will form a thick and gloopy paste which makes a fabulous, vegan-friendly egg replacer. Mix all of the dry ingredients (flour, coconut sugar, baking powder, cinnamon and beetroot powder) in a large mixing bowl. In a saucepan place the coconut oil, almond milk, apple cider vinegar and vanilla extract. Put on a low heat until the coconut oil has melted – you don’t want it to bubble or boil, so remove from the heat as soon as it’s all liquid. Add the chia/water mix into the dry ingredients and stir through. Then add the wet ingredients to the dry, and mix well to form a thick batter. Lightly grease a doughnut tin with a little coconut oil to ensure the mixture does not stick. Fill each doughnut hole with around 2 tbsp of the batter, making sure you leave the hole in the middle. Bake in the oven for around 8-10 minutes – I had to do mine in two batches as I only had one, six-doughnut tin. Allow the doughnuts to cool in the tin for a couple of minutes before using a knife to gently remove them onto a wire cooling wrack. Leave to cool completely. Make the glaze by splitting the bar of white chocolate between two bowls, with a teaspoon of coconut oil in each, and melt them both. I zapped mine in the microwave for around 45 seconds. 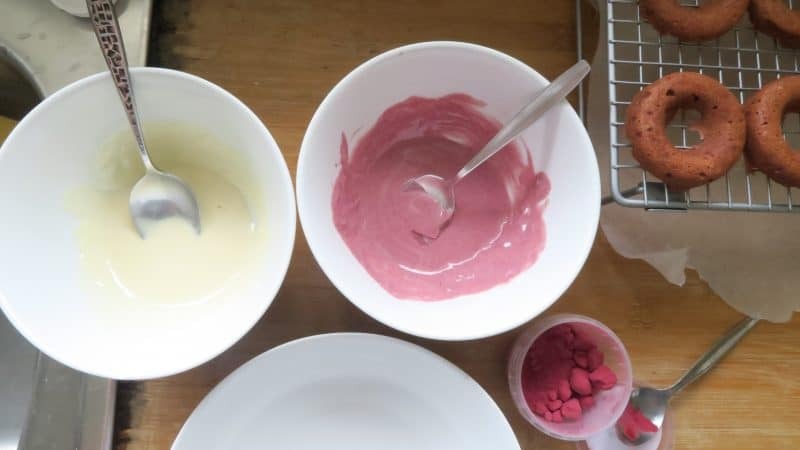 Once melted, add the beetroot powder to one of the bowls and mix well until the chocolate is a rich pinky/purple colour. 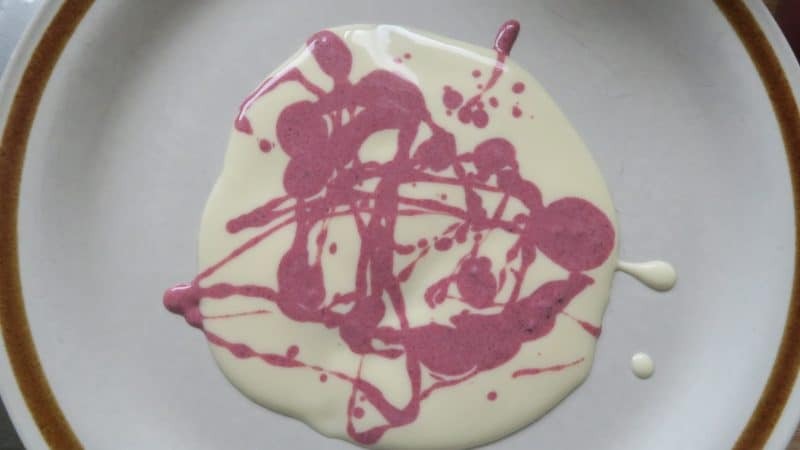 Pour the white chocolate onto a plate, spread out a little and then dot on blobs of the pink mix. Swirl a little with a knife and then dip the doughnut into the swirl. Lift out carefully and place back on the rack to dry. Cover with sprinkles if desired and place in the fridge to set for 20-30 minutes before eating. These look absolutely mouth-watering! I want to try them myself but I know I’ll mess up the consistency on the icing. I am so impressed with your 10,000 mark! Well done! And what a lovely way to celebrate….. doughnuts…. Yay! I made these today and they turned out perfectly! Amazingly easy, super delicious! I’m so glad you liked them, they looked amazing!